Arietta was founded in 1996 by John Kongsgaard and Fritz Hatton. John Kongsgaard was well known for decades in the Napa Valley for his work at Newton and for wines produced under the Kongsgaard label, and Fritz Hatton also had a reputation as a wine Auctioneer. John Kongsgaard and Fritz Hatton set out to blend not only wine, but music and their love of wine as well. In 2003, they began producing Cabernet Sauvignon wines from vines that were planted in the famous vineyard of Thorevilos, owned by David Abreu. The following year, in 2004, they added a blend of Left Bank Bordeaux varietals calling it Claret. In 2005, things changed at Arietta because Fritz Hatton bought out the shares of John Kongsgaard to become the sole owner of the property. Next, they brought in Andy Erickson as their wine maker. After John Kongsgaard left the estate, in 2006 Claret was renamed Quartet. The wine remained unchanged until the 2009 vintage, which had the grapes coming from vines located in the Coombsville appellation, also planted by David Abreu. When Arietta first began producing wine, their initial purchase was a small, 2.3 acre parcel of Cabernet Franc planted in Hudson Ranch. Hudson Ranch is located in the Caneros appellation. Arietta also produces a white Bordeaux wine blend called On The White Keys, from a blend of Sauvignon Bland and Semillon. The wine is barrel fermented and aged in a combination of stainless steel tanks and new, French oak barrels. The wine made its debut with the 2006 vintage. If you have ever wondered about the piece of sheet music on the label for Arietta, the graphics features the Airetta movement from the Last Piano Sonata from Beethoven’s Arietta movement, Opus 111. The piece was chosen not only for its musical genius, but to honor the achievement by Beethoven, who composed the sonata after he had already gone completely deaf. They are definite lovers of classical music at Arietta and Kongsgaard. In fact, if you ever visit Kongsgaard, it’s impossible all the classical music that is always playing in the winery. Arietta makes the following wines. Arietta Quartet is a blend of 4 Bordeaux reg grape varietals which is on average, 58% Cabernet Sauvignon, 21% Cabernet Franc, 19% Merlot, 2% Petit Verdot. The wine is aged in 35% new, French oak barrels with a production of about 1,350 cases per vintage. Arietta Merlot is made from 100% Merlot, aged in 45% new, French oak barrels for 21 months. The production is quite small at close to 350 cases per year. 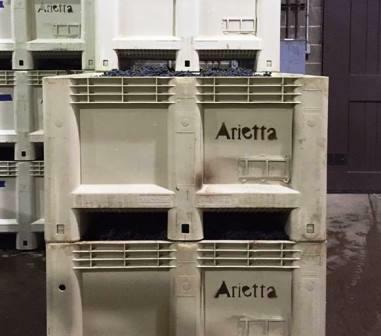 Arietta Cabernet Sauvignon is made from 100% Cabernet Sauvignon and aged in 70% new, French oak barrels for 21 months. The production is slightly more than 400 cases per year. Arietta Variation one is a blend of 67% Syrah and 33% Merlot, aged in 41% new, French oak barrels. The production averages 350 cases per vintage. Arietta On the White Keys is a blend of Sauvignon Blanc and Semillon. Arietta is best served at 15.5 degrees Celsius, 60 degrees Fahrenheit. The cool, almost cellar temperature gives the wine more freshness and lift. Young vintages can be decanted for 1-3 hours, depending on the character of the vintage. This allows the wine to soften and open its perfume. Older vintages might need very little decanting, just enough to remove the sediment. Arietta is best served with all types of classic meat dishes, veal, pork, beef, lamb, duck, game, roast chicken, ribs, hamburgers, barbecue, roasted, braised, grilled dishes and stews. Arietta is also good with Asian dishes, hearty fish courses like tuna, salmon, mushrooms and pasta. The wines of Arietta are sold primarily through their mailing list program. Full bodied, round, forward, fleshy styled wine, with a smoky, blackberry core of fruit in the center. Very herbaceous. I was surprised to learn it’s a Merlot/Syrah blend. This is definitely a huge wine. I could sense the quality, but stylistically, it was not a wine I wanted to drink. When the $100 price tag is factored in, this is a big pass for me.